Here is the full set of images from David Beckham's shoot with Arena Magazine. For Halloween Regis and Kelly dressed up as Posh and Becks for their show. Kelly put on a "English" accent that made her sound like Oliver and they opened their show by taking the piss out of the Beckhams. This is not the first time Regis and Kelly have done this. When the Beckham's W magazine came out, Regis and Kelly mimicked their poses. I believe if David and/or Victoria ever went on this show (which I hope they don't) I bet Regis and Kelly would be kissing their asses. I guess they are miffed that the Beckhams have not been on their show. Victoria Beckham was live on Ryan Seacrest's radio show this morning in LA. She talks about the her kids dressing up for Halloween, her new hair do, the Spice Girls, her book and her hubby David. Ryan continues to insist David and Harry Potter sound the same and he plays a clip, which is very funny. I’d like to start this week’s blog by letting you know about a very important game that LA Galaxy are playing. The team will be playing against Hollywood United FC in a friendly game on November 4th to raise money for all those affected by the recent wildfires, which have devastated a large part of Southern California. So if you can come along it would be great to see you there to raise money for this very worthy cause. Although the regular season has come to an end, I’m still busy working on my fitness and the Galaxy still have some friendly games coming up in Vancouver and Minnesota, which will help with my overall match fitness. I’m going to be working hard and I hope these games will lead to me being considered for England’s matches against Austria and Croatia, but of course its up to the manager to decide who he picks! I’m writing this blog from St Mary’s in the Scilly Isles, where I’m currently filming a brand new Adidas advert with Steven Gerrard. Although it’s a busy filming schedule, I’ve managed to meet some of the islanders, including the children and it was great to have a kick about with them. The islands are amazing and beautiful and I’d love to come back with the family for a holiday. Anyway, I’d better get back to it. He better get picked for the England game at Wembley on 21 November, as I have tickets. 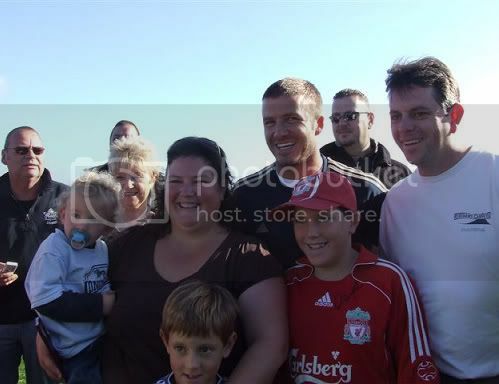 David Beckham flew in to St. Mary's in the Scilly Isles in the UK to film an Adidas TV commercial that also stars Liverpool midfielder Steven Gerrard. Hundreds of people flocked from across the island of St Mary's to catch a glimpse of the football heroes. Some even sailed boats from neighbouring islands Bryher and Tresco to join the action. David was happy to pose for photographs and sign autographs. He later joined children from the Five Islands school for a kickaround, and dropped in to Radio Scilly - the smallest radio station in the world - to give an interview to presenter Keri Jones. "He came across as really nice, a really down-to-earth guy," said Jones. "But we're used to celebrities here. Jude Law comes here a lot - and he went on David Letterman the other week to say the Scillies are the best place on Earth." "Beckham really liked the place, the sun was shining, and he said his kids would love it here," said Jones. Life is just not fair. Why is David never filming an ad near where I live? 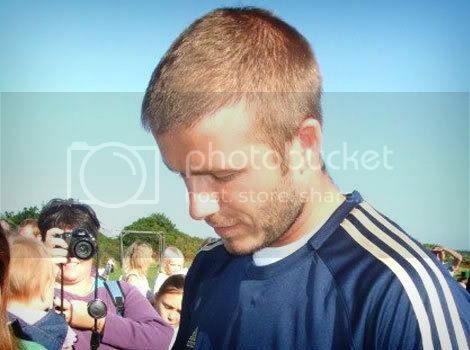 Here are some photos of David Beckham out with his team-mates meeting fans. I hate those two girls. I'm not to proud to say how extremely jealous I am. Victoria Beckham and the Spice Girls are reportedly set to appear on Oprah. No exact date has been set yet, but it would be a 'major' for the girls to appear on such a show, especially following Victoria's appearance on Ellen tomorrow. These new pictures are of Victoria wearing a gorgeous purple fitted dress as she visited Nicky Chapman yesterday. Here is a cute picture taken on 29 October of Victoria Beckham going pumpkin picking in Moorpark, California with Romeo. Looking at her hair it is brunette with some blonde highlights. I am still not convinced that this is the final do. Victoria Beckham added a new entry into her blog. It's to inform us that the paperback version of That Extra Half An Inch is released this week (Thursday November 1st) in the US. In Arena Magazine David Beckham opened up about his new life in Los Angeles and his friendship with devout Scientologist Tom Cruise. 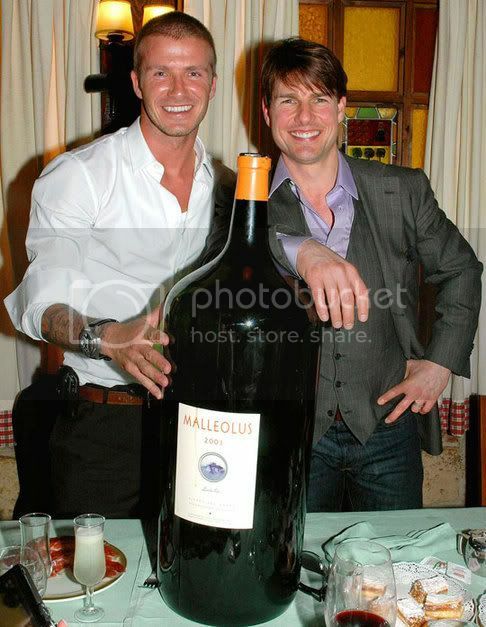 David has forged a close bond with the actor in recent years, insists that neither Tom nor wife Katie Holmes have attempted to convert the Beckhams to Scientology. David said: "We respect their religion. We respect everything they do and believe in." Tom and wife Katie Holmes welcomed David and Victoria to LA with a huge star-studded party in July, and have continued to help them settle into their new life. David told Arena: "They are amazing people who are just so positive about life and they have been great to us." David also has another close Hollywood confidant - Jennifer Lopez's singer husband, Mark Anthony. David revealed: "We talk about all sorts. What's happening that week, that day. What Jennifer's up to, what Victoria's up to. I speak to him at least three or four times a week." Despite reports both David and Victoria are homesick after struggling to crack the US, he says the family is making LA home. He said: "Victoria has done an amazing job on the house. She made sure the kids got into the right schools. It was a big move for them coming without their friends, their nans and granddads. But they love it. They say 'awesome' a lot." Beckham also discussed how he keeps the fire alive in his marriage. He said: "We do romantic things every day - write notes, make breakfast for each other. Something will happen every day that is romantic." "Some people will be going 'yuck' at all this...We were lucky to have wanted the same things in life - to have kids young and be adventurous." In other news it has been reported that Katie Holmes has cooled her relationship with Victoria Beckham because at the Welcome to LA Party, apparently Katie saw Victoria and Eva Longoria making fun of Tom's dance moves. All very high school if you ask me. Arena magazine has relaunched with David Beckham on the front cover. This was a very smart move by the publication who has struggled in recent times. David Beckham being on the front cover in bound to get you in every newspaper and blog - which is has. David has been named Britain's most powerful man aged 40 or under by the magazine. Becks said: "I am really honoured. To get that title for just being a footballer is quite amazing." Arena editor Giles Hattersley said: "Beckham has topped this year's Arena Power List because he is arguably the most recognisable Brit on the planet." "David is our biggest sporting export and has inspired boys of all ages to become passionate about football - and fashion." "He boasts a formidable CV - on and off the pitch - and at 32, has already lived the lives of 10 men." I agree, he is the best this country has to offer. For all those who missed Victoria's hilarous experience on the Japanese show Smap Smap, I have found it on You Tube. Here is an interview of Victoria Beckham on Extra at Kelly Hoppen's Book Launch. I hate Terri Seymour's voice, she only has the job because she is dating Simon Cowell. Back in August I showed the first picture of David and Victoria Beckham's Intimately Night fragrance ad. Here is a cropped, clearer version. David Beckham is to play in a special charity match to raise money for those affected by the devastating wildfires in southern California. LA Galaxy will take on a celebrity team called Hollywood United at the Home Depot Center on Sunday 4 November. The match will benefiting the US Red Cross and the Salvation Army. The Hollywood lineup is expected to include actors Anthony LaPaglia, Jimmy Jean-Louis, Costas Mandylor; musicians Steve Jones and Vivian Campbell; and former World Cup players Frank Leboeuf, Richard Gough, Joe-Max Moore and Eric Wynalda. Former Galaxy standouts Lalas and Mauricio Cienfuegos also are set to play. 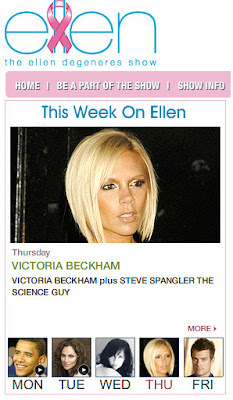 Victoria Beckham will on the Ellen DeGeneres Show on Thursday 1 November. Being in the UK, I will not be able to see it live, but the show will no doubt be on You Tube Thursday evening so I will try to post it then. This will be Victoria's third interview in the US following her appearance on The Today Show with Matt Lauer & The Tonight Show with Jay Leno. She will no doubt be talking about her new hairdo, the Spice Girl tour, how much she loves LA, her fragrance and clothing range. Hopefully we will see the new 'do' in full before Thursday, but we may have to wait until then. 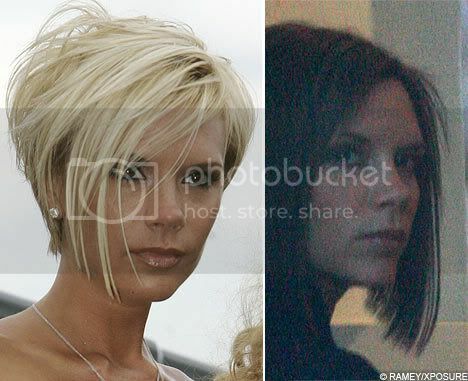 Here are some pictures of Victoria Beckham with Jessica Galvan the woman/salon owner responsible for Victoria's recolour. These pictures were taken prior to the launch of Victoria and David's fragrance, Intimately Beckham, in the US. I guess Ben Cooke (her hairstylist) was out of town that day. When I read this it made me laugh, so I thought I would share. Gossip website Popbitch reported that on a recent flight, one of the flight attendants stopped to chat to Victoria Beckham. She listened for a while but, when it got too much, she just raised a hand. Her bodyguard then quietly told the flight attendant: "Victoria doesn’t want to talk any more." Not sure if I believe it or not, but it's pretty funny. Victoria Beckham is back to her more natual colour of brunette. I did love the blonde, but I much prefer her as a brunette. She spent hours at the Jessica Galvan Hair Studio in Beverly Hills on Friday to achieve this look. I just wonder how this hair colour change will affect the promotional materials already done, like the video and group pictures. UPDATE: This is apparently just the beginning of the transformation. There is talk of a new cut also. What a lucky girl. 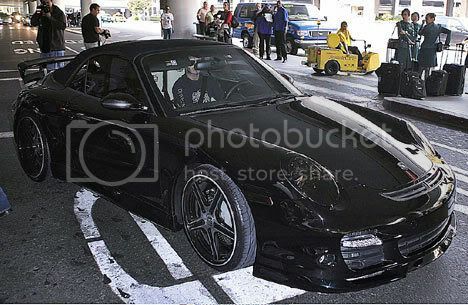 David Beckham met his gorgeous wife at LAX in his brand new Porsche 911 Turbo Cabriolet. The car cost £100,000, (small change to the Beckhams), and David then spent another £100,000 having it completely modified, including the "23" motifs in the rests. I am guessing Victoria's luggage went in another car (or a truck), as girlfriend does not travel light.